Introducing the new Cenco AP Physics lab series. Ideal for AP, B and C, I, II, and advanced honors physics courses, each of the 24 experiments is aligned with the College Board AP Curriculum. The teacher guides and student manuals are authored by an experienced AP Physics teacher, so you can trust the setups to be successful in your classroom. Lead students through these hands-on labs using the outlined guided-inquiry approach. All labs come complete with instructions and materials for up to six students per lab group, the inquiry based instructions are found in the separate manuals. For your convenience, labs are packaged to allow you to purchase only what is required for each experiment. The use of a video camera offers students a new way to investigate the motion of an object due to gravity. An included launcher has two setting for varying the launch speed and the removable washers allow you to change the mass of the projectile. As an investigation of motion of acceleration due to gravity, students first determine the motion of a constant velocity car. When the graphs of the motion of the car and projectile are analyzed, students will develop a better understanding of acceleration and constant velocity. 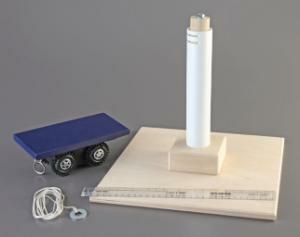 The kit includes a vertical launcher with a variable mass, a constant velocity car, and a ruler. Required but not included is a video camera and meterstick.